The Bridges Series Knee Sleeves feature the camo design preferred by Rogue athlete and 3-time Top Ten finisher at the CrossFit Games, Josh Bridges . Check out Josh's athlete page here. Made from 5mm thick neoprene, Rehband’s 7751 knee compression sleeves deliver consistent support with a unique level of flexibility. This allows any athlete—from Crossfitters to Strongman competitors—to tear through a regimen without discomfort or a restriction of movement. Whether you’re dealing with regular knee pain, recovering from an injury, or looking to prevent one, Rehband Knee Supports supply joint compression and warmth to promote better blood flow and reduce the direct strain on the knees during squats, Oly lifts, etc. Rehband 7751 5mm Knee Support - Bridges Series is rated 4.8 out of 5 by 35. Rated 5 out of 5 by Bitties from Absolute Necessity. Its one of those things; How did I work out for so long without these? After 14 years in the Marines, it wasn't the years it was the miles on the knees. I had laid off squatting for years and decided I needed to try these supports to strengthen and stabilize my knees. The pain is almost completely eliminated and my form improves, not to mention it adds lbs to my max. I make everyone I work out with get a pair. Truly superlative product. I'll never lift without them again, no hyperbole. Rated 5 out of 5 by dev9891 from Amazing I purchased these knee sleeves about two months ago and they are worth the money! 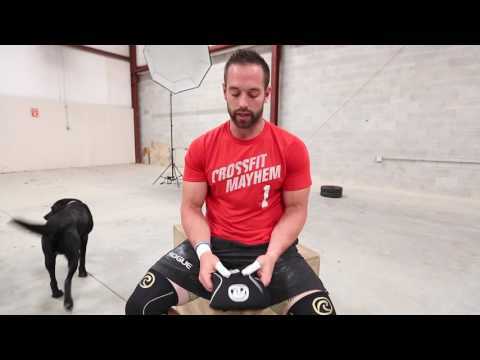 I am an active crossfit athlete and I do experience knee pains sometimes after workouts. I don't wear these all the time but when I do, I can definitely feel a difference. The only complaint I can say is that they seem to have shrunk a little after I have washed them a few times and I do let them air dry. I would recommend sizing up, but it seems a lot of other reviewers have recommended the opposite. Rated 5 out of 5 by JSlice from These things are Awesome! Figured I'd give sleeves a try after hearing many people at my gym swear by them. These sleeves are awesome, they really give you that support at the bottom of your squats and snatches. I like the camo color too. I'm 5'-10", 180lb with larger than normal legs and thighs and ordered a set of large sleeves based on the sizing chart. They fit perfect. keep in mind that sleeves come in different neoprene thicknesses. These were 5mm and I wouldn't recommend anything thinner for heavy squats. Rated 5 out of 5 by Willchriswill from Great Investment Added knee support and protection for heavy below parallel squatting. I'm already hitting new PR's!!! Great investment. Rated 5 out of 5 by Vader from Perfect I have been using these for about 3 weeks now and they have been perfect! The fit is excellent and my knees haven't ached after a workout the way they did before wearing them. Rated 5 out of 5 by Rhodycrossfitgrinder from As advertised I've never used knee braces before, but was recommended to try them by the coaches at my crossfit gym. Worth every penny. I'm more confident in my range of motion, they keep my knees warm and give me the amount of support I was in search of!